Our Everyday Western Gift Wrap comes in Western and English designs that were created with an eye for detail. Giving the look and feel like they were taken right from the beauty of the English countryside or straight out of the Old West. Browse for designs containing horses, dressage themes, spurs, rodeo and more! This Western Gift Wrap is sold in half ream and full ream. A full ream is 24"x833' and a half ream is 24"x417'. Choose from a total of 30 designs. 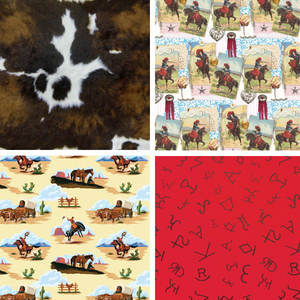 Also check out the Christmas Western Gift Wrap for more festive western designs.